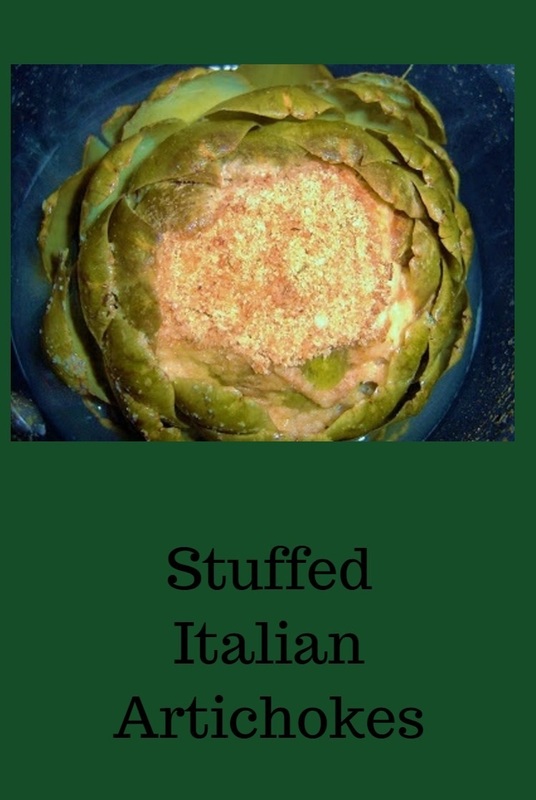 I use to look forward to Easter every year, when mom made these Italian Stuffed Artichokes for the Holiday. 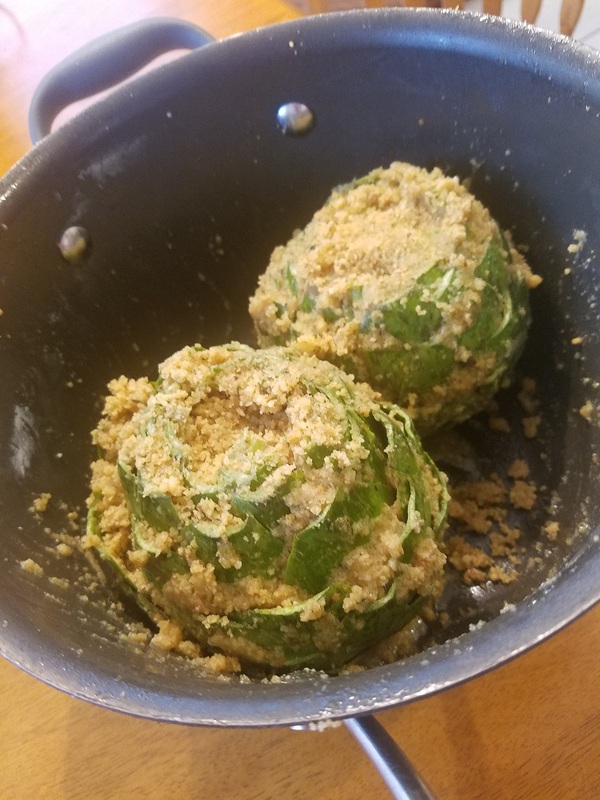 Stuffed Artichokes were always a favorite. They were a Holiday special in our home, not everyone ate them but I totally am a huge fan. Now after all these years have past I make them more often than just Holiday time. 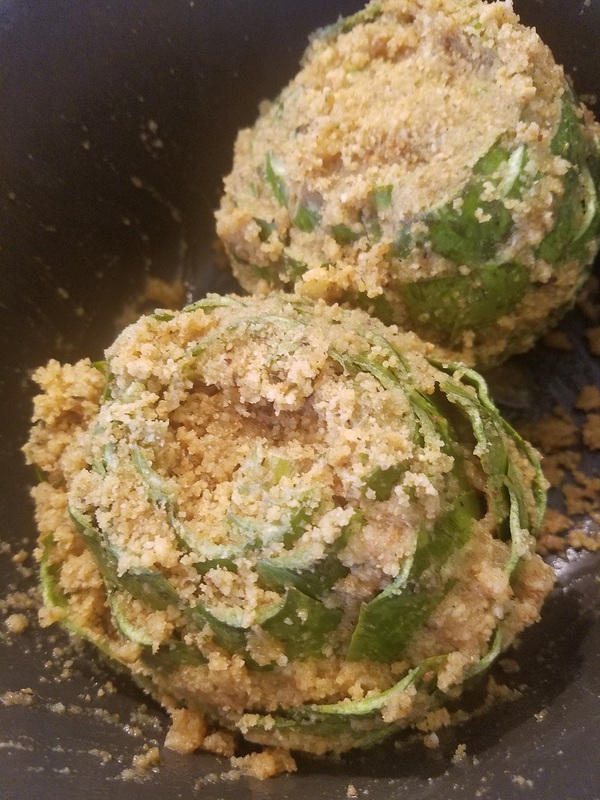 I find them to be very flavorful and I just love the heart of the artichoke which is my favorite part of all along with the delicious stuffing inside. Snip the pointed prickly tips of artichoke leaves, and cut off the stems. Wash and drain. Holding artichoke firmly by base, firmly rap the top of it on a hard surface; this will open it so it can be stuffed. In a medium bowl combine bread crumbs, 1 clove of fresh garlic minced, garlic powder, parsley, Romano cheese, oregano, oil salt and pepper; mix well add some olive oil to make it hold together, a few tablespoon. Press about 1/2 cup of stuffing into each artichoke. Tightly pack stuffed artichokes together in a large heavy saucepan or Dutch oven. Add enough chicken broth or water to reach half way up artichokes, making sure they are upright in the pan and then drizzle around 3 tablespoons of additional oil and remaining garlic cloves in the water. Sprinkle salt and pepper to taste. Bring to a boil over high heat; reduce heat to low and simmer, covered, for at least 2 hours or until leaves pull out easily, slow cooking for at least 2 hours. These can also be done in the slow cooker on high using around 2 cups chicken broth for 6 to 8 hours.